PHOENIX (Dec. 19, 2008) - Greater Phoenix is a home away from home for fans of Ohio State&apos;s football team, which is preparing to play a bowl game here for the fifth time in seven years. For Buckeye fans who might be undecided about whether to revisit the desert for the Fiesta Bowl on Jan. 5, here&apos;s something for them to remember: The typical January day in Greater Phoenix is sunny and 66 degrees, and the only ice they&apos;re likely to see will be rattling around in a beverage glass. Ah, spending bowl season in America&apos;s sunniest metropolis. It&apos;s becoming almost as much of an Ohio State tradition as dotting the "I" and thumping Michigan. "We love Ohio State fans. They travel well, and they wear their colors all over town," said Douglas MacKenzie, Communications Director for the Greater Phoenix Convention & Visitors Bureau. "They&apos;re here so much, we should probably plant some buckeye saplings alongside all our saguaro cactuses and palm trees." Buckeye trees or no buckeye trees, the Fiesta Bowl has been good to Ohio State, which was victorious in each of its three Fiesta Bowl appearances this decade and captured the national championship in 2003 by beating Miami 31-24. When picking a restaurant in Greater Phoenix, consider a dining room with a view. Many restaurants feature open-air patios where you can watch a postcard-perfect sunset or dine beneath desert stars. Among the restaurants with the best winter patios (and creative cuisine) are Bourbon Steak, Café Bink, Elements, Kai, Lon&apos;s and Talavera. 9. Relish a resort experience. More than 40 luxury resorts adorn Greater Phoenix&apos;s desert landscape and staying at one is a vacation in itself. Expect gorgeous grounds, kingly service, fine food, and access to world-class golf courses and spas. Many of Greater Phoenix&apos;s resorts are located in or near Scottsdale, where the Old West meets the New West on pedestrian-friendly streets famous for Western art galleries, trendy restaurants, Cowboy bars and the best club scene between L.A. and New York. 8. Succumb to a spa treatment. Thanks to all those resorts, the spa scene in the Greater Phoenix is different than anything the average spa-goer has ever experienced. Nestled within mountain folds, on tribal lands and in the shadow of monolithic boulders you&apos;ll find one of the most impressive collections of resort spas in North America. Put your body and spirit in the hands of a Native American medicine healer; awaken your skin with creosote oil, gold dust or turquoise-hued Azulene mud; partake in an ancient Hammam bathing ritual; or let Quantum Biofeedback technology melt away your stress from the inside out. And hot-stone massages? They were invented in Greater Phoenix. Insight Bowl fans will be among the first Phoenix visitors to ride the city&apos;s new public transportation system: METRO Light Rail. This 20-mile network links downtown Phoenix to nearby restaurants, nightlife and museums, and provides a speedy route to and from the airport. The light-rail line also connects Phoenix to Tempe, so if you book accommodations in downtown Phoenix, it&apos;s possible to take the train to Sun Devil Stadium and the Mill Avenue District, avoiding New Year&apos;s Eve traffic. An added bonus: Those fans who arrive Dec. 27-28, light rail&apos;s debut weekend, can ride the line for free. Heard Museum provides fascinating insights into the culture and history of Arizona&apos;s 22 Native American tribes. It features both traditional and contemporary works, including what is perhaps the world&apos;s greatest collection of Kachina dolls. And here&apos;s a tip for visitors in search of meaningful souvenirs: The Heard Museum Shop is one of best places in Phoenix to buy authentic American Indian jewelry and art. Desert Botanical Garden is fun for the whole family - even the guys. This 50-acre outdoor museum showcases endangered desert species from around the world, including Dali-esque trees from North Africa and sprawling cactuses from Mesopotamia. And this winter the garden&apos;s splendor is enhanced even further thanks to an exhibit by world-renowned glass artist Dale Chihuly. His organic and colorful creations are ingeniously integrated among the flora, and each is spectacularly illuminated after nightfall. If kids designed a museum, it would look like Children&apos;s Museum of Phoenix. The city&apos;s newest museum experience features a hanging forest made of foam swimming noodles, a miniature grocery store with scanners and box-filled aisles, and a wooden racecar track that would tickle the fancy of M.C. Esher. And you can touch everything. This museum doesn&apos;t focus on art or science, nor does it contain paintings or bones; instead, the exhibits are designed to stimulate and entertain kids under 10. The museum also is a short stroll from the likewise-kid-friendly Arizona Science Center, which houses more than 300 interactive exhibits, a planetarium and an IMAX theater. 5. Cheer for another team. Greater Phoenix is one of only a half-dozen U.S. cities with eight professional sports franchises, and one of the locals&apos; favorites is the Phoenix Suns. Led by two-time league MVP Steve Nash, explosive All-Star Amare Stoudemire and veteran big man Shaquille O&apos;Neal, the Phoenix Suns have brought the NBA playoffs to Phoenix 18 times in the past 20 seasons. The Suns play their home games at US Airways Center, and the Los Angeles Clippers will be in town Jan. 2. Shopping is a serious sport in America&apos;s fifth-largest city. From fashionable malls to chic boutiques to charming antique shops, Greater Phoenix harbors a spectrum of retail experiences few destinations in North America can match. Take advantage of the pleasant weather to stroll the garden-park setting at Biltmore Fashion Park, the outdoor promenade at Keirland Commons or the sidewalk shops of Old Town Scottsdale. Peruse high-fashion couture at Scottsdale Fashion Center, or search for bargains at have-it-all malls such as Chandler Fashion Center, Westgate City Center and Tempe Marketplace. Wherever you stay in Greater Phoenix, you&apos;re not far from a park or preserve. On the city&apos;s southern frontier is South Mountain Park and Preserve, the largest municipal park in the nation. The park occupies 16,000 acres just a few miles south of downtown (by comparison, Central Park encompasses 843 acres of Manhattan real estate) and is adorned by native flora and ancient petroglyphs. Its 50 miles of trails are popular among hikers, mountain bikers and horseback riders, and there&apos;s also a paved road to South Mountain&apos;s summit so cyclists and motorists can enjoy the bird&apos;s-eye view. Other easily accessible spots for outdoors pursuits are Phoenix Mountains Park and Camelback Mountain. The former is home to Piestewa Peak, which is reached via a 1.2-mile summit trail that&apos;s a favorite of active families and trail runners. Camelback Mountain, meanwhile, is Phoenix&apos;s most famous natural landmark. The mountain&apos;s silhouette resembles a dromedary camel in repose, and it challenges hikers with a rugged trek to its 2,700-foot "hump". 2. Play 18 ... or 36. The Scottish invented golf, but Phoenicians might have perfected it. Greater Phoenix is home to more than 200 golf courses, many designed by legends of the game such as Jack Nicklaus, Tom Weiskopf and Pete Dye. This is desert golf at its best, with emerald-green fairways set against a panorama of rugged mountains and towering cactuses. Some courses occupy canyons where civilization feels a world away, while others are part of opulent resorts where you can relish a "warm golf ball massage" after your round. 1. See one of the Seven Natural Wonders of the World. Phoenix is the gateway to America&apos;s most iconic natural landmark: the Grand Canyon. It&apos;s a 3½ to 4-hour drive to the canyon&apos;s South Rim, depending on how many stops you make (and there are plenty, with the red rocks of Sedona being a favorite). Those who seek a quicker and more dramatic route to the Grand Canyon can book an aerial tour that will take them sweeping over the 277-mile geologic marvel in an airplane. Keep in mind, true wintry weather awaits at the Grand Canyon&apos;s higher elevation, and you might even be lucky enough to see it dusted in snow. 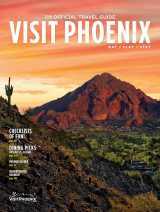 For more details about the above attractions, plus information about where to stay and dine in Greater Phoenix, travelers can log on to www.visitphoenix.com.